We recently updated our rolled-arm cream couches for a more contemporary look. Our new couches are squarer in shape and are a deep linen colour with a lovely rich linen texture, we are really enjoying them and I think the neutral colour will mean they will work for a long time yet! One thing that I have been missing about the old couches though are all the cushions it had. 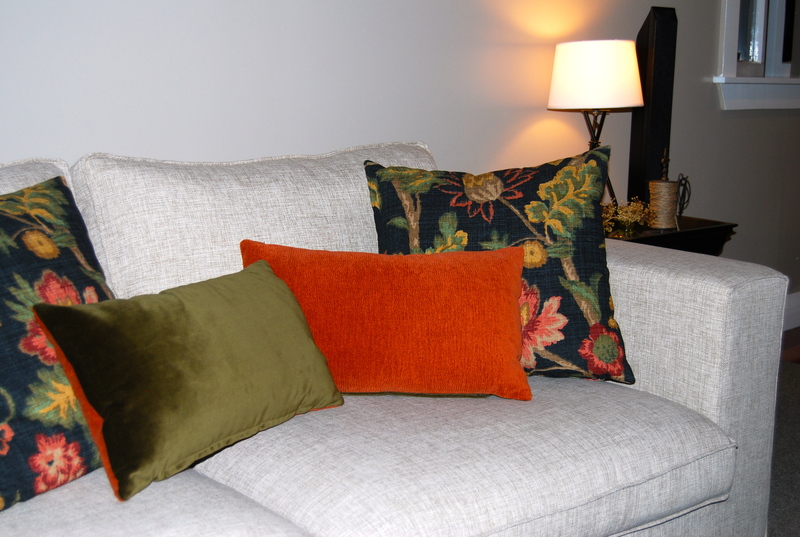 Cushions to me add comfort, warmth and make the room so much more relaxing and inviting. With mum’s help I found some gorgeous velvet which adds further texture and brings out the colours of these cushions I made a while ago. I couldn’t decide whether to go with the ‘olive’ or the ‘orange’ look so I decided to get both fabrics and use them on each side of my cushions so they can be flipped over depending on the season (or my mood for that matter). They look stunning ! Does Hubby like them ?